A big thanks to Sheila Gunthrie for letting me know about the Speculative Fiction Blog Hop, and inviting me aboard! Check out her post here! Now, for my own addition to the long chain! 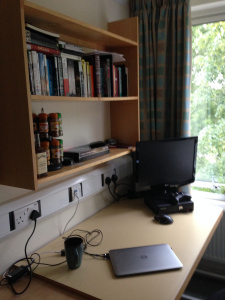 My desk in my university dorm, where I finished my debut, and wrote my second novel.